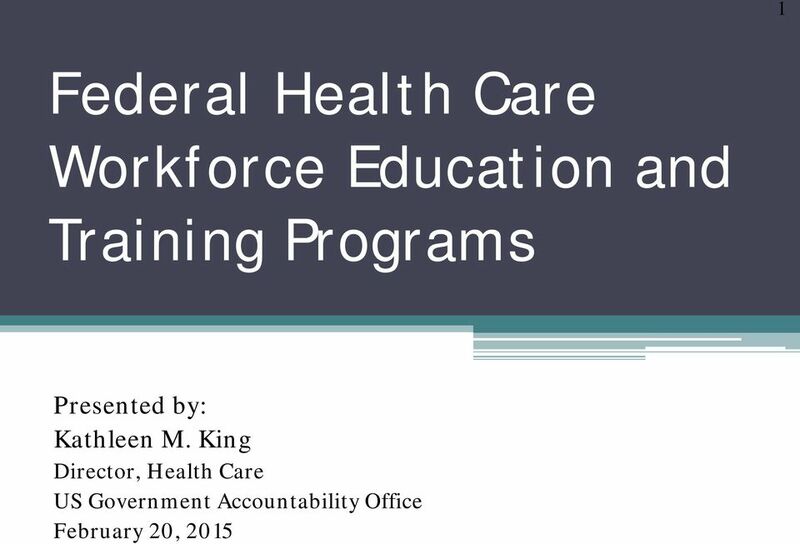 Download "Federal Health Care Workforce Education and Training Programs"
3 3 Overview of GAO The U.S. Government Accountability Office (GAO) is an independent, nonpartisan agency that works for Congress. 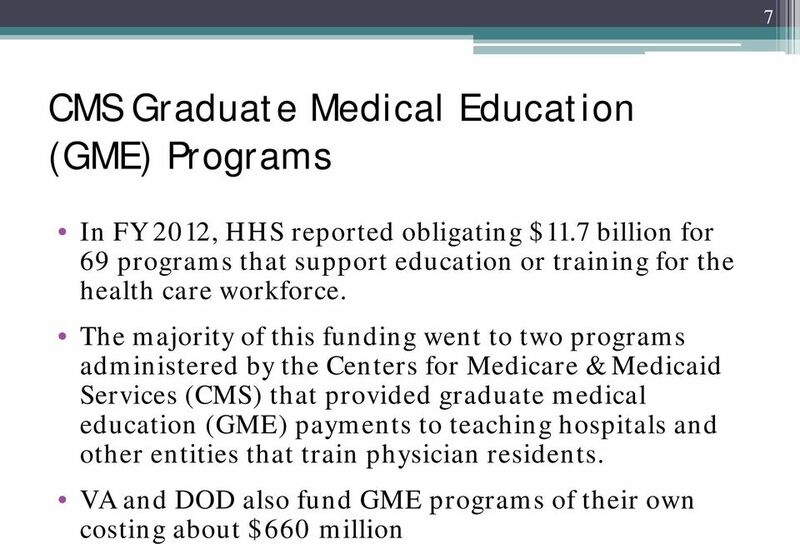 Often called the "congressional watchdog," GAO investigates how the federal government spends taxpayer dollars. 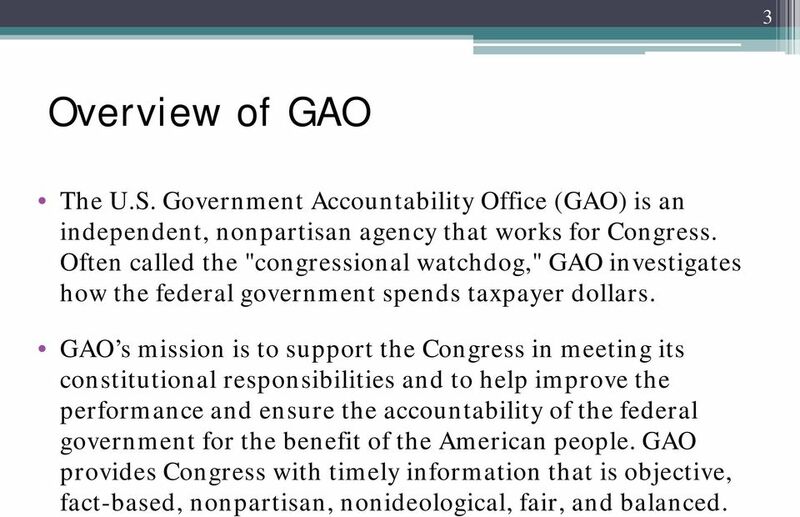 GAO s mission is to support the Congress in meeting its constitutional responsibilities and to help improve the performance and ensure the accountability of the federal government for the benefit of the American people. 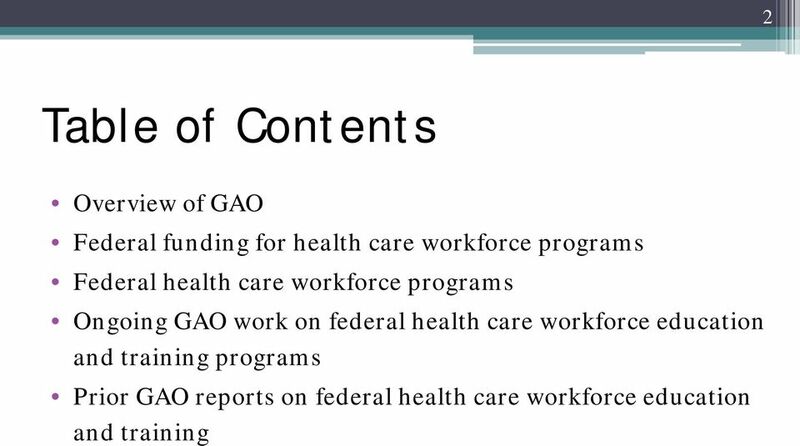 GAO provides Congress with timely information that is objective, fact-based, nonpartisan, nonideological, fair, and balanced. 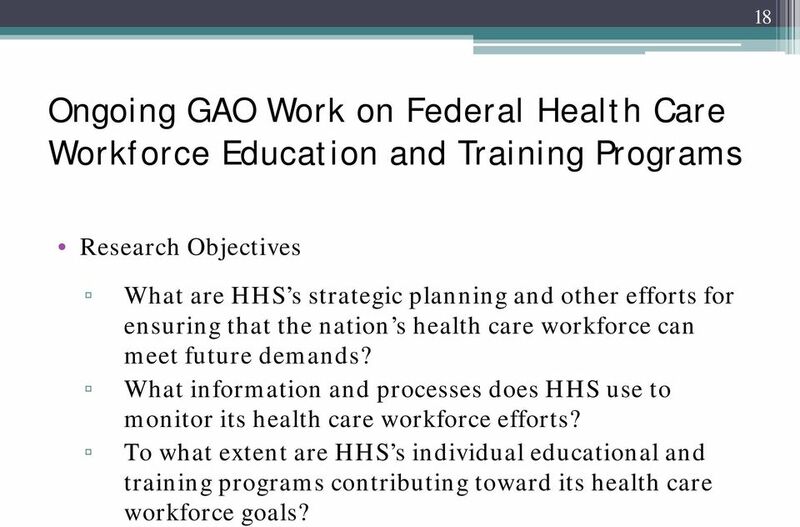 18 18 Ongoing GAO Work on Federal Health Care Workforce Education and Training Programs Research Objectives What are HHS s strategic planning and other efforts for ensuring that the nation s health care workforce can meet future demands? 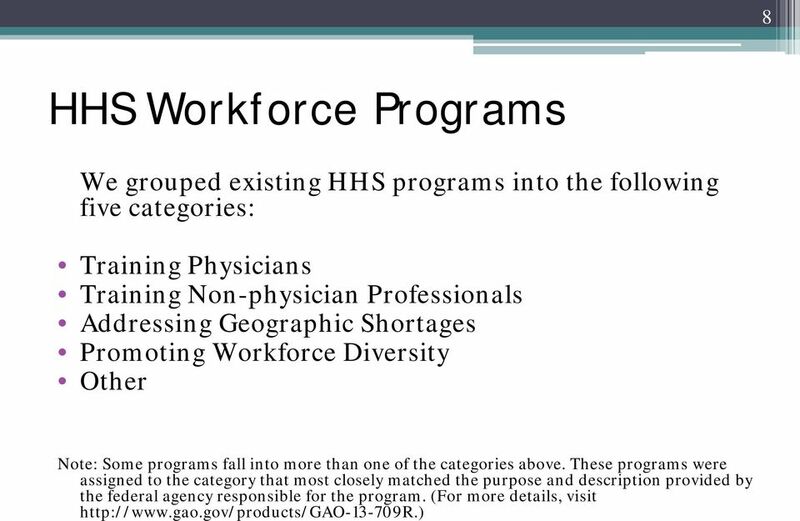 What information and processes does HHS use to monitor its health care workforce efforts? 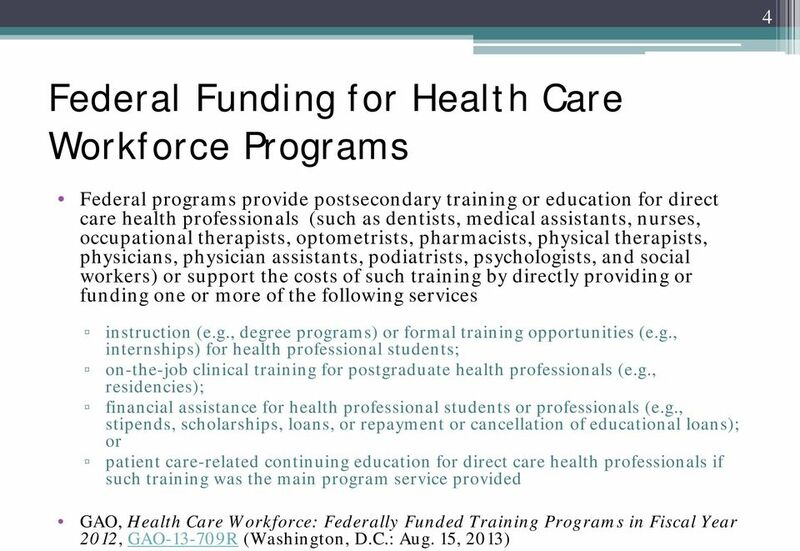 To what extent are HHS s individual educational and training programs contributing toward its health care workforce goals? 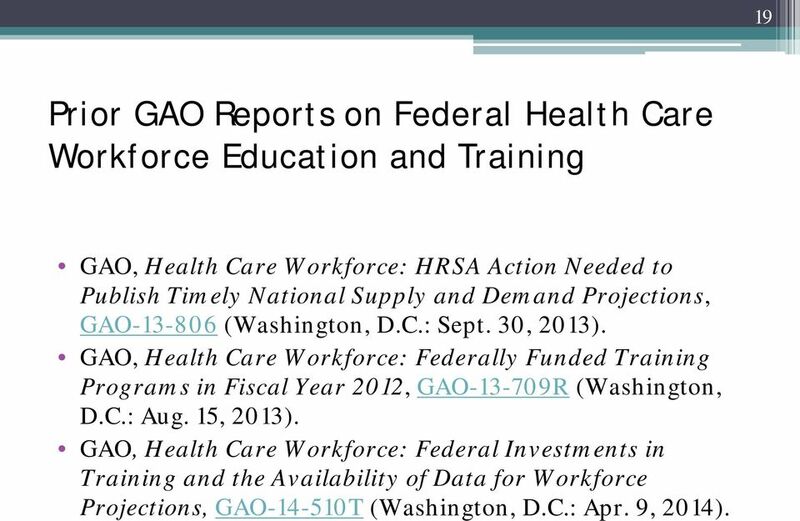 19 19 Prior GAO Reports on Federal Health Care Workforce Education and Training GAO, Health Care Workforce: HRSA Action Needed to Publish Timely National Supply and Demand Projections, GAO (Washington, D.C.: Sept. 30, 2013). 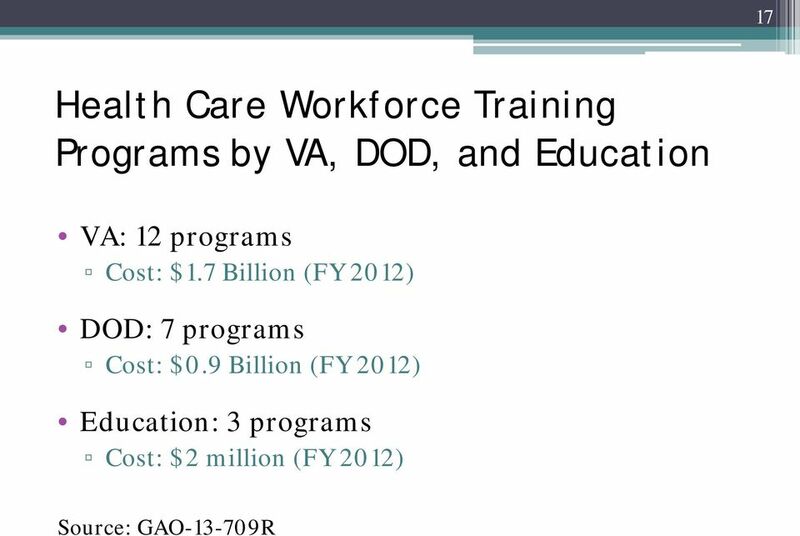 GAO, Health Care Workforce: Federally Funded Training Programs in Fiscal Year 2012, GAO R (Washington, D.C.: Aug. 15, 2013). 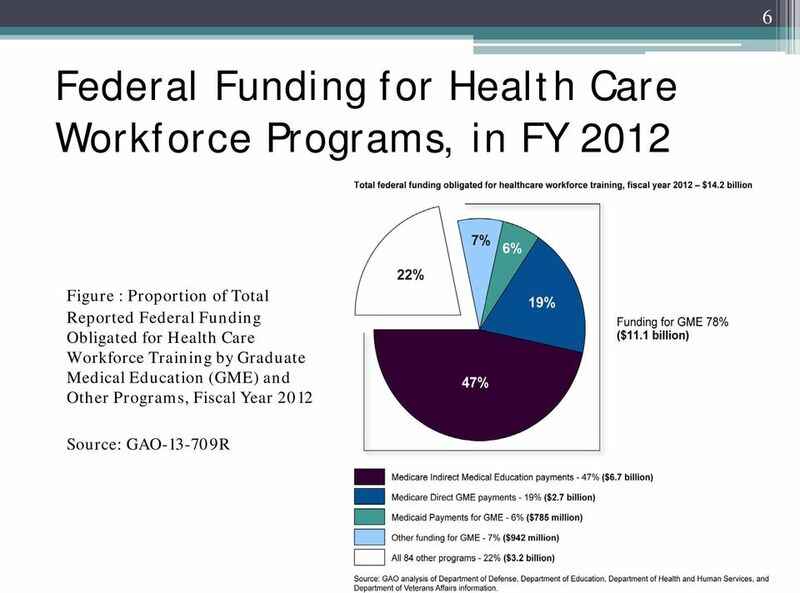 GAO, Health Care Workforce: Federal Investments in Training and the Availability of Data for Workforce Projections, GAO T (Washington, D.C.: Apr. 9, 2014). 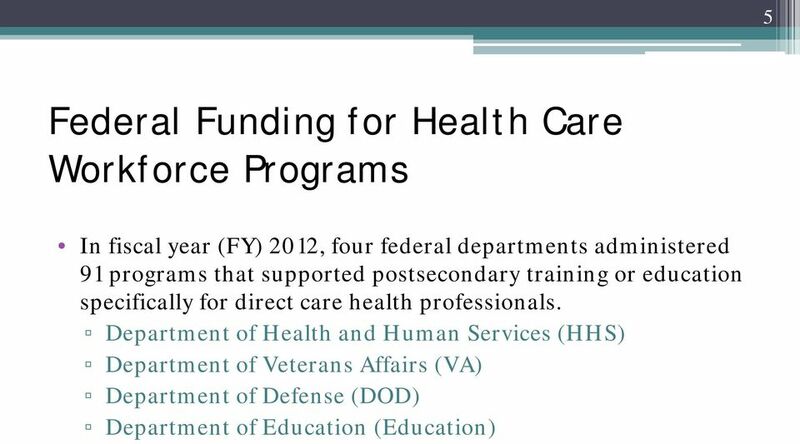 HRSA Division of Nursing Funding Opportunities. 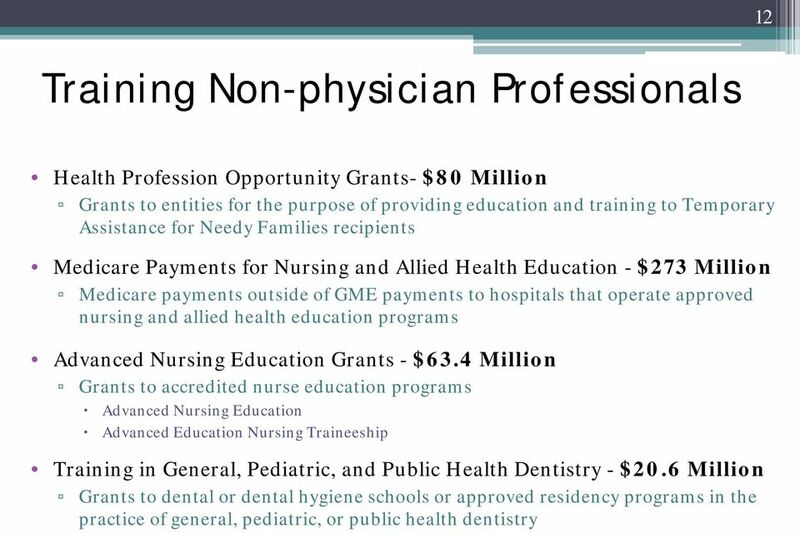 Division of Nursing (DN) Division of Nursing (DN) - Cont. 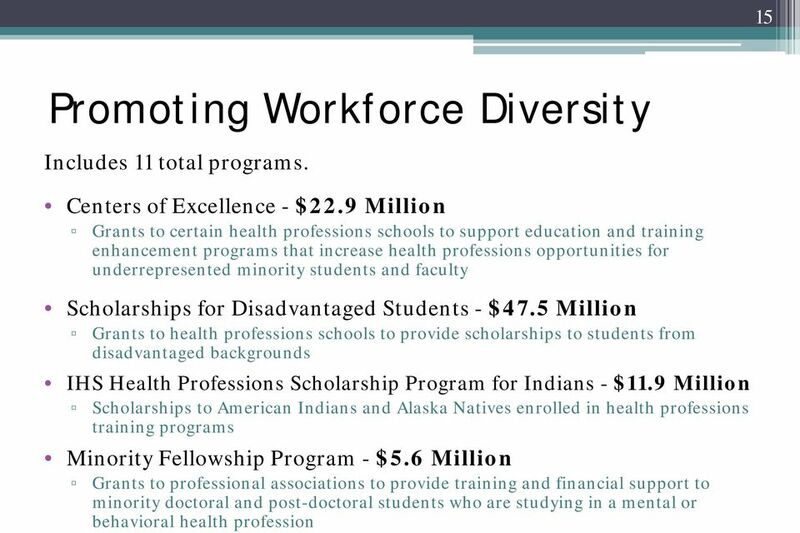 `SEC. 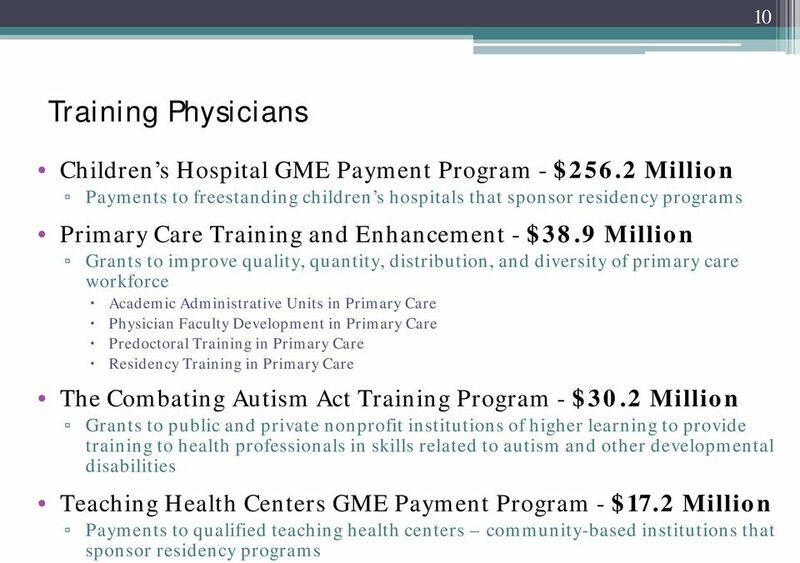 428K. 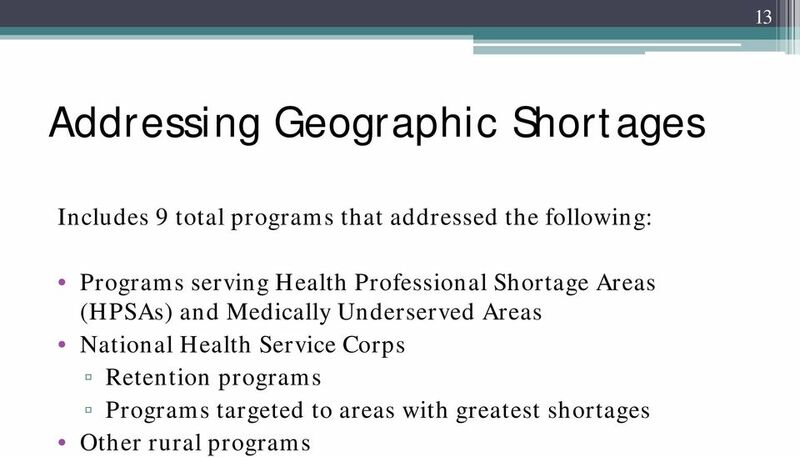 LOAN FORGIVENESS FOR SERVICE IN AREAS OF NATIONAL NEED.